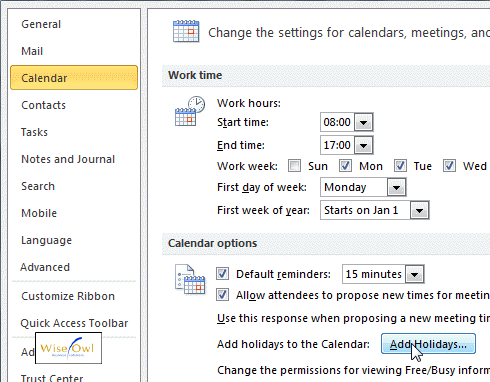 It seems appropriate that on the first day back at work in 2012, we should be looking at when our next holidays are! If you are using Outlook 2010 then you'll be able to follow the steps below - if you're using an earlier version you'll need to find the equivalent settings (they are there!). Go to the File tab and then choose Options. Which holidays would you like? This owl spends his working time in the UK, so doesn't need to include Venezuela's Battle of Carabobo Day on 24th June. 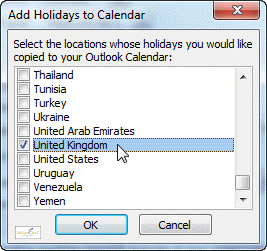 Outlook should confirm the successful addition of the holidays to your calendar. Click OK once more and you're done!